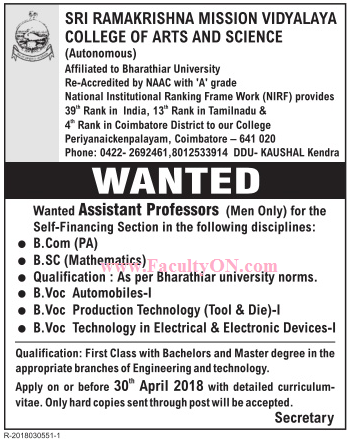 Sri Ramakrishna Mission Vidyalaya College of Arts and Science, Coimbatore has advertised in the DINAMALAR newspaper for recruitment of Assistant Professor (Men only) jobs vacancies. Interested and eligible job aspirants are requested to apply on or before 30th April 2018. Check out further more details below. About College: The college was started in 1964 with the blessings of Srimat Swami Madhavananda Maharaj and has completed 53 years of purposeful service to the student community and society. The college follows the great ideals placed before the country by Sri Ramakrishna, Swami Vivekananda and Mahatma Gandhi. The institution believes that the greatness of a man is to be judged by his attitude, outlook and devotion rather than by the work he does. How to Apply: Interested and eligible candidates are requested to send CV along with copies of certificates and recent PP size photo to the postal address provided below. Only HARD COPY of applications will be accepted.